Favorite Film Directed by Steven Spielberg? On the outbreak of the First World War, Albert's beloved horse 'Joey' is sold to the Cavalry by his Father. After being sent to France, in a bid to survive, Joey has an unexpected journey across war torn Europe. Albert enlists in the British Army, and is wounded during the Battle of the Somme. Whilst recovering in Hospital, he learns of a Horse, found in no mans land. Separated by war. Tested by battle. Bound by friendship. Albert Narracott: We'll be alright Joey. We're the lucky ones, you and me. Lucky since the day I met you. 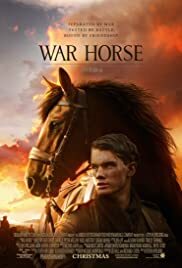 Q: Is War Horse based on a book? John Williams score - wall to wall - reminds us this is a Steven Spielberg film. 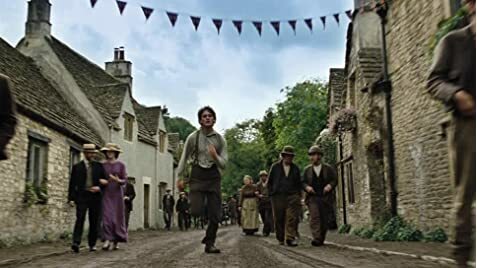 The Spielberg from "Always" not the Spielberg from "Munich" To say the film is a sentimental boy and horse tale kinds of says it all but, to be honest, not quite all. The battle scenes, WWI this time, are from the same man (men) who gave us those glorious first 45 minutes of "Saving Private Ryan" The display of means is staggering. "Paths Of Glory" and "Pride Of The Marines" came to mind. Our hero, played by Jeremy Irvine, reminded me of young heroes in Disney movies, Tommy Kirk for instance. He's pretty and harmless. But the horse, well the horse is a whole other story. Brilliant performance. I think the Academy should be seriously considering an animal category. This year alone we had this remarkable horse, plus the amazing dogs in "Beginners" an "The Artist" I know, I'm rambling, well so did "War Horse" but in a much prettier way of course.